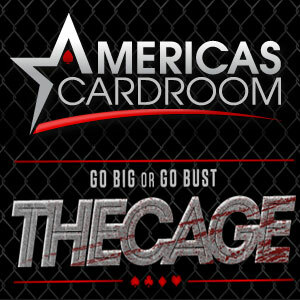 America's Cardroom and the Winning Poker Network are running a new tournament / cash game hybrid event called The Cage. The Cage is a $5,000 Buyin 3 hour long event. You start the event with $5,000 in chips and what you have left after the 3 hours is what you walk away with. Blinds escalate as you go. It's a brilliant format, and a heavy satellite schedule allows those who dream of playing high stakes cash games a chance to do so affordably. Even better, as a RBN Member you have a shot to satellite into The Cage for free. We're awarding 12 $33 satellite seats in a freeroll. Time / Date: Tuesday the 23rd at 5:30pm eastern. 1. If you don't already have an account - sign up for Americas Cardroom. Tourney is not visible on other WPN skins. 2. Login to the RBN Members Area for the password. 3. Register. You'll find the tournament under Private tab on the Tournament window. "PTP Cage Freeroll - 12 Seats".